As an experienced network and security expert, CipherEx has deep expertise in the technologies and methodologies that comprise network security strategies. Instead of focusing on security hardware and software alone, CipherEx takes a holistic approach to security that spans people, processes, policies, and technology. Companies without a well-planned strategy will be left behind. That's why it's more critical than ever to align with an experienced partner. (1888PressRelease) December 03, 2017 - ORINDA, Calif. ─ Protecting your network is becoming increasingly difficult and costly, as hackers continue to find new ways to penetrate your defenses. The combination of virtualization, mobility, and cloud computing has triggered an explosion in the quantity of data being created, shared, and managed by enterprises. 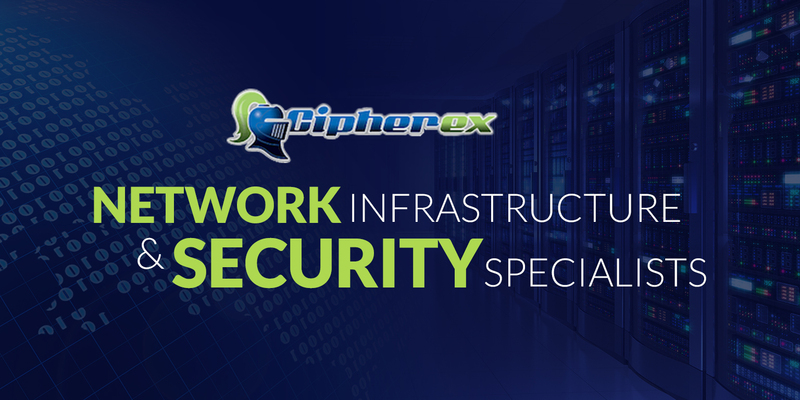 Specializing in Cisco infrastructure security, CipherEx works closely with Cisco to ensure the products and infrastructure it builds are secure. CipherEx’s end-to-end security services across all risk areas allow organizations to create an intelligent infrastructure that drives down costs and effectively mitigates the risks to network systems and infrastructure. CipherEx teams with industry-leading partners who provide the cutting-edge technologies to address today’s current and emerging threats. CipherEx’s infrastructure security solutions include consulting services, Identity Service Engine (ISE) implementation, advanced malware protection (AMP), wireless LAN controllers (WLC), firepower firewalls and IPS, and two-factor authentication. Regardless of the network type employed, security is one of the biggest challenges for today’s interconnected systems. To minimize risk and project rework, it’s imperative for organizations to involve network and infrastructure security experts at the earliest stages of strategy development, including when assessing core security and compliance requirements. For more information about CipherEx’s infrastructure security services or for a free network assessment, contact CipherEx at (888) 774-9244 or visit http://www.CipherEx.com. Established in 2003, CipherEx is a network consulting company based in the San Francisco Bay area specializing in network infrastructure and network security. The company’s goal is to help its clients build a networking environment that will proactively evolve with their organization’s needs, improve the user experience, and bolster corporate security.